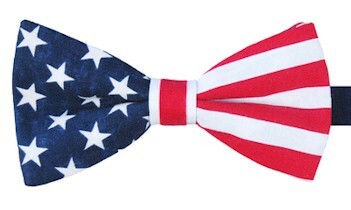 Neck Size 12 1/2" - 23"
Mens 2 1/2" Patriotic Bow Tie / American Flag Bow Ties - Cotton fabric pre-tied banded bow tie. This is a banded bow tie which means it has an adjustable strap that goes around the neck and clasps under the tie. The strap adjusts from 12.5 to 23 inches around the neck.